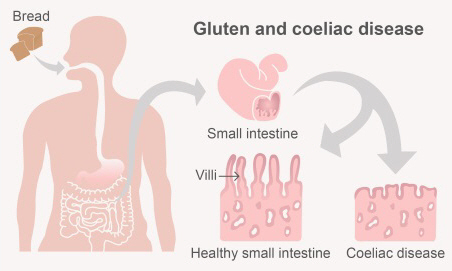 People with coeliac disease have a permanent intolerance to gluten (a protein that's in wheat, rye, barley, and oats). There is no cure for coeliac disease, and the only effective treatment is to follow a gluten-free diet, which you will need to do for the rest of your life. By not eating gluten, you remove the cause of the disease, so your small intestine lining can heal and any symptoms you have will get better. It's important to eat a gluten-free diet even if you don't have any symptoms, as you can still damage your small intestine by eating gluten. A gluten-free diet means avoiding foods that contain gluten, which is a protein found in wheat, rye, barley, oats, dinkel (also called dinkel wheat and spelt) and triticale (a cross between wheat and rye). Choose foods that are naturally gluten-free, for example, fresh and frozen vegetables and fruit, rice, milk, yoghurt, cheese, eggs, nuts, seeds, legumes (cooked dried beans, split peas and lentils) and unprocessed meat, fish, and chicken. Most pasta, spaghetti, lasagne, fettuccine, and so on. *See the Crossed Grain Gluten Free Shopping Guide or the Gluten Free NZ app (android phones only) for a suitable variety. The app may not contain some recently available gluten-free foods. FoodSwitch also has a filter you can set to see only gluten-free foods. This is a useful website with information about coeliac disease, eating gluten-free, reading food labels, dining out tips, and shopping guides. Handy tips for adapting recipes, and eating out. Hundreds of recipes for gluten-free foods. Written by the Christchurch Branch of Dietitians New Zealand. Endorsed by GP liaison, Gastroenterology, Canterbury DHB. Last reviewed July 2017. Last updated March 2019. Anderson, R.P. (2005). Coeliac disease. Australian Family Physician, 34 (4), 239-42.